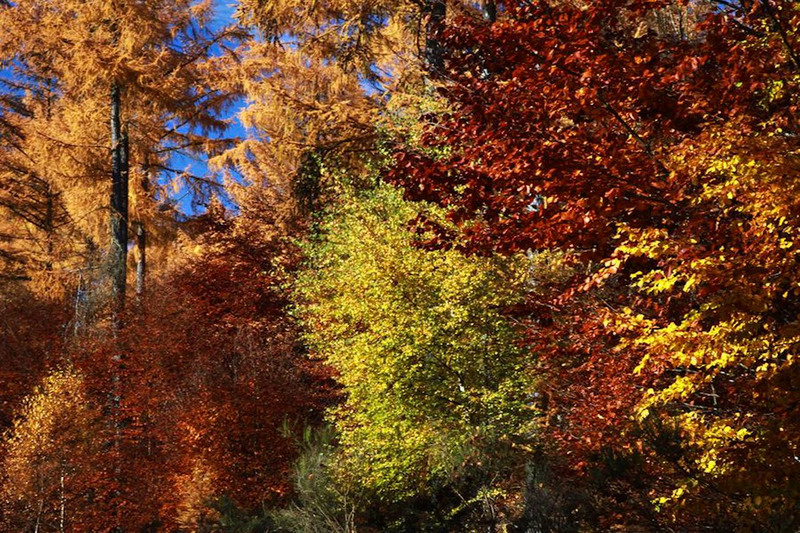 The German National Park Hunsrück-Hochwald lets its forests develop freely. The objective is to reach a natural tree species composition and to give the forest room and time to do so on its own. The National Park management also decided to give a third of the trails going through the protected area back to nature. The National Park Hunsrück-Hochwald was only established three years ago. But first results of the Park’s aspired objective to leave the forests to evolve naturally are already visible. The tree species composition of the area’s young trees already shows a higher diversity. The management aims to push back spruce in favour of beech and and downy birch. Already about 83% of young trees are beech, according to the ministry for environment and forestry of Rhineland-Palatinate. Whereas only 46% of older trees are beech. Spruce just constitutes for about 15% of young trees and around 39% of older trees. Beech would be the natural tree cover of the National Park Hansrück-Hochwald. This development of a more natural tree species composition is supposed to decrease the risk of bark beetle infestations. Infested and fallen spruce trees as well as fallen trees from storms are left as dead wood. The resulting high amount of dead wood is a unique feature of the protected area and offers rare habitats for numerous species depending on dead wood. To enable the bogs, marshes and floodplains of the park to restore their natural species compositions, the park management implemented temporal active restoration measures. These measures will be finished this year and mainly included planned clearing of spruce and the closing of old drainage ditches. Restoring measures on the Götzenbach, a creek running through the National Park, are planned as well. This year the park management starts with the ambitious objective to decrease the number of trails going through the area. Within the course of the next ten years about a third of the trails should be left for natural rewilding. Plants can overgrow them and creeks or other water bodies will not be stopped when overflowing these trails. This project aims on re-connecting habitats that have been cut up by these trails and enable the restoration of a biotop network. Nevertheless, the National Park plays an important role for the sustainable development of the whole region. About 40 gastronomy businesses already fulfill the criteria to be a “National Park-Partner”. This proves that sustainable tourism is getting more and more important in the region. The decisions of the National Park Hunsrück-Hochwald to enable natural forest development and connect cut-up habitats are an important step to the rewilding of Europe. According to the Wilderness Continuum of Roderick Nash an area can move up or down along this continuum depending on the amount of human intervention. The decisions of the park’s management to keep their hands off, or to only actively support restoration for a limited time, and to let nature develop on its own, moves the area closer to Wilderness. This means that over time this area has the potential to become Wilderness and to be part of the European Wilderness Network. What does tourism do for wildlife conservation?